Drawing clear inspiration from the BMW 3 Series that has defined the compact luxury segment for so long, the Cadillac ATS sedan may have beaten that German stalwart at its own game. Just how? The ATS, a homegrown effort from General Motors’ reborn luxury division, delivers an especially sharp driving experience honed from years of development in BMW’s back yard--specifically, Germany’s high-speed Autobahns and demanding race courses. The ATS is offered in a variety of flavors, from mild to spicy. At the entry-level end of things sits the 2.5-liter 4-cylinder ATS. With 202 hp on tap, it offers decent power combined with the best fuel economy in the ATS lineup: 21 mpg city/33 highway. From there, the lineup goes in two distinct directions. More sport-oriented trims utilize a 2.0-liter turbocharged 4-cylinder rated at 272 hp that can be mated to either a 6-speed manual transmission or the same 8-speed automatic that comes standard on other variations of the ATS. The range-topping 3.6-liter V6 engine, rated at 335 hp, won’t offer the same rush of highway passing power as the torque 4-cylinder, but it's nevertheless the most refined engine on offer. Opt for the 4-cylinder turbo and you’ll net as high as 21/30, while the V6 is rated at 20/30. V6 and turbocharged ATS models can be further optioned up with all-wheel drive, a boon for wintry weather conditions. Notably, most trim levels of the ATS include Brembo-branded brakes, the same kind used on many high-end European sports cars. A magnetic damping suspension comes standard on higher-specification ATS trims for a more performance-oriented feel that is designed to reduce body lean and improve grip under more aggressive driving. Inside, the ATS is notable for its premium materials and avant garde design. Cadillac offers a variety of interior styling combinations that pair specific leatherette or leather seating surfaces with unique wood or carbon-fiber trim. A wide array of options are available for the ATS sedan regardless of trim, but even the base iteration is well equipped. Depending on the engine selected, ATS sedans can be configured in Standard, Luxury, Performance, and Premium trim levels, each of which brings a few additional features and a different personality to this wedgy 4-door. Opt for the Luxury package and above and you’ll net Cadillac’s CUE infotainment system, which uses a touchscreen with integrated haptic feedback to handle audio and optional navigation controls. Recently upgraded, CUE should be generally familiar to those used to tablets and smartphones. A pair of packages add safety tech to the ATS as well. The Safety and Security package brings with it sensors that will alert the driver if the car drifts out of its lane, if there are vehicles in its blind spot, and if there are cars hidden from the backup camera’s field of vision while pulling out of a parking spot. From there, the Driver Assist package adds adaptive cruise control to keep the car a set distance from the vehicle in front and front/rear automatic braking designed to reduce the severity of an impending collision. GM’s OnStar safety and concierge system comes standard on all examples of the ATS. The latest version of OnStar includes a 4G LTE hotspot, though it requires an extra monthly charge. 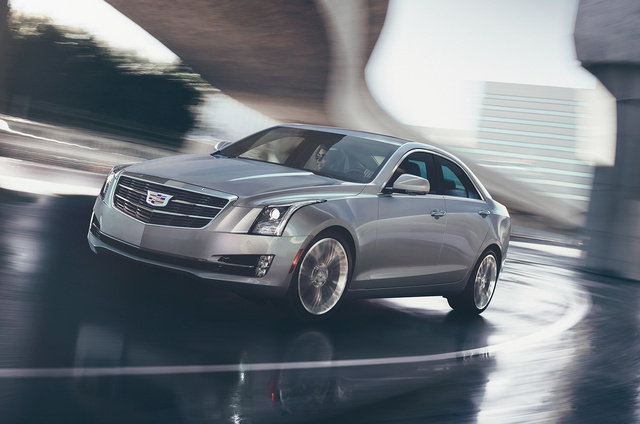 What's your take on the 2017 Cadillac ATS? Have you driven a 2017 Cadillac ATS?